Business today is the crossing point of information which are originated or deducted from different information resources. The process of assembling pieces of functionality into complex business processes very often necessarily involves human interaction which in turn heavily depends on environment and domain-specific Knowledge. 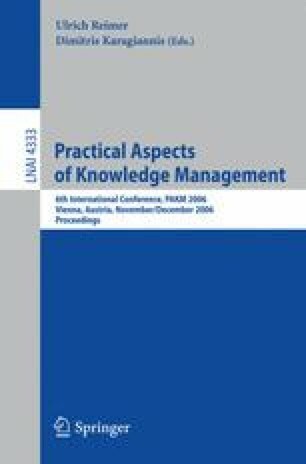 This paper deals with the use of Personal Information Management Systems and Semantic Web technology as enabler of business processes to realize the auto-interaction of customized processes, resources and events. Using an approach to integrate Semantic Filters in the proposed “business pipelines”, it is possible to address the most important issues of Process Integration and Process Automation. The paper presents the SemanticLIFE research project and its applications in the tourism domain for business process automation by providing semantics for business pipelines and localization of process pipelines based on the semantics of Personal Information of potential clients. We will also provide a solution for automatic service orchestration of semantic services as semantic pipelines. Finally, we propose the Semantic Ranking model to evaluate the Semantic Matching in a typical tourism recommendation scenario.